Our Wellness Hotel Kakadu has been welcoming its guests for nearly 15 years, and from February 2009 it awaits you with a completely new atmosphere: following the newest trends it offers extended "wellness", medical and "selfness" services. 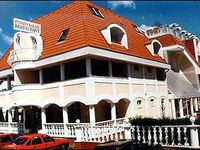 The hotel is located in Keszthely, some 500 metres from the shore of Lake Balaton. Our homely hotel is open the whole year long, in our 29 rooms and 4 suites we can accommodate nearly 100 people in comfort. Our meeting room has conference equipment and can seat 45 people. Room equipment: balcony, double bed, TV, telephone, alarm clock radio, built-in safety deposit box, refrigerator, kitchenette, shower, toilet, hair dryer. The rich buffet breakfast and the dinner are served in the restaurant located on the ground floor, where you also find a drink bar. The two buildings of the hotel are connected with a wellness area, which features a heated overflow pool, and plenty of exotic and Mediterranean plants. From the pool you can take the panorama lift to the roof terrace, from where you can enjoy a breath-taking view of the town Keszthely. Let us pamper you in our Wellness Club: cosmetic face and body treatments, wellness massage a'la carte: traditional and Oriental massages, foot massage, manicure, pedicure, sauna, infra-red sauna, solarium, jacuzzi, steam cabin, aroma cabin. 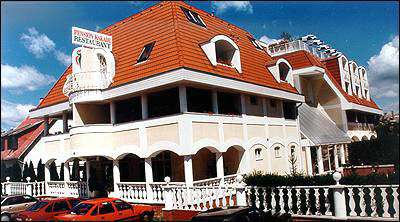 Medical services: Services of a professional, well-equipped dental surgery are also available in the hotel. On (prior) request we can offer you bio-resonance health check-up and life style advice too. • The hotel's own parking lot is available for the guests at 1600 HUF per car per day. • Pets are allowed for an extra charge of 4500 HUF per day.